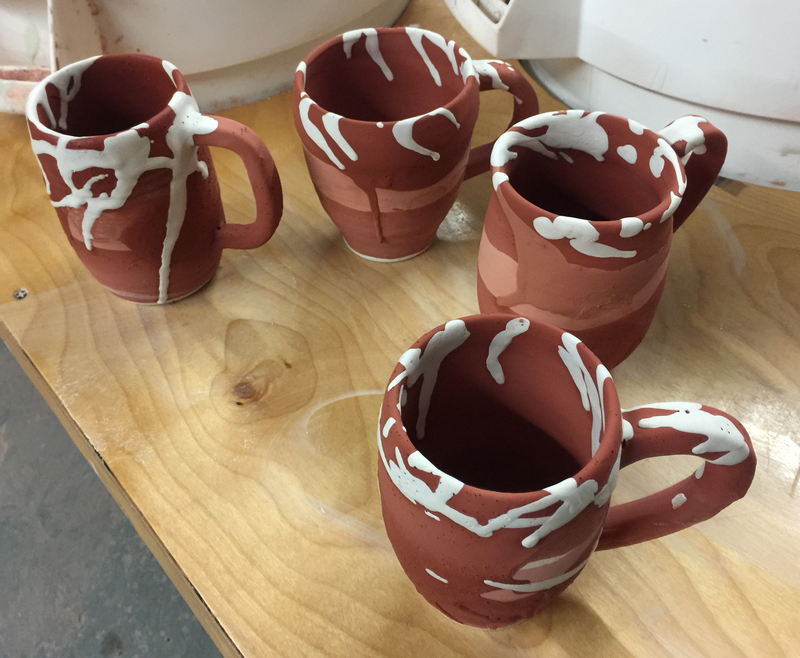 Left & Middle Cups = Starry Night Base, Coastal Blue dip 1/2 way down, topped with Cream. 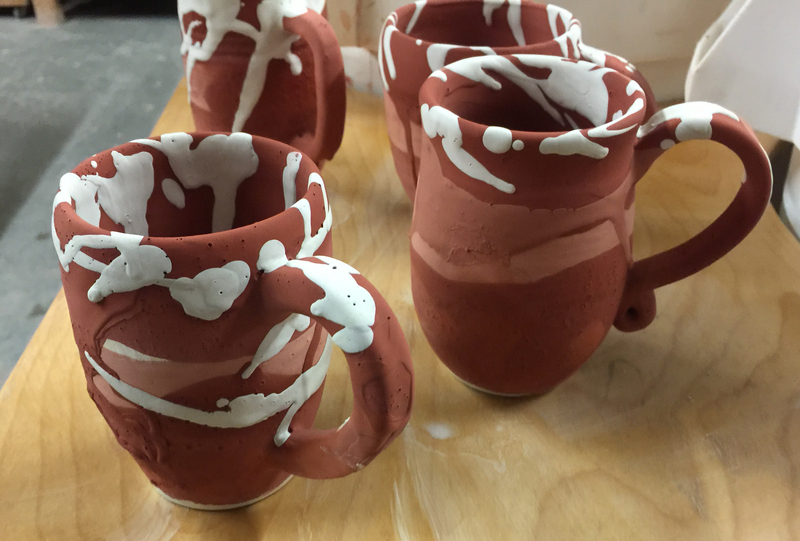 It was a nice exploration of the glaze effects – albeit with the tiny variables of how long it is heated in the kiln, how high the kiln temperature is, and where it sits in the kiln. I brought the cup on the right to work to test it out – the drinkability (i.e. how it rests on my lips as I drink my coffee, how balanced does a full cup of coffee sit, how do my fingers feel and lay while holding the cup with the handle, etc). I love the smooth roundness of the cup. But I am seeking a more blue effect, a #CosmicBlue effect that reminds me of space, space gas, exploration, evolution, God’s creation, etc. 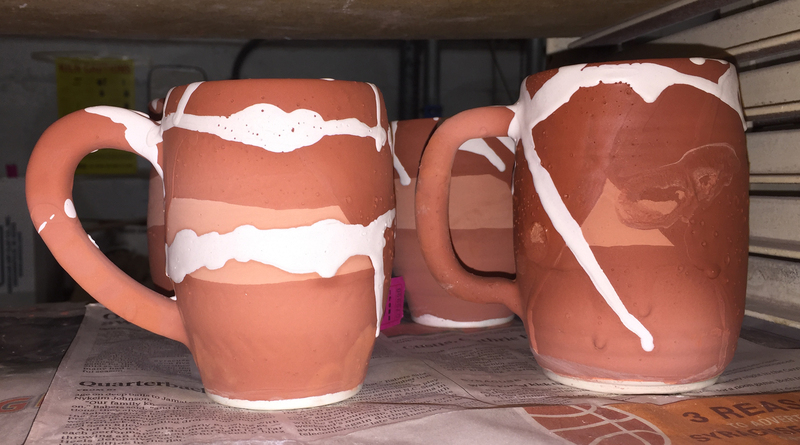 Recent inspiration came from a Pintrest whereas the middle of the pottery piece had a distinctive band of glaze that was then accentuated by cosmic glaze on the upper and lower parts. 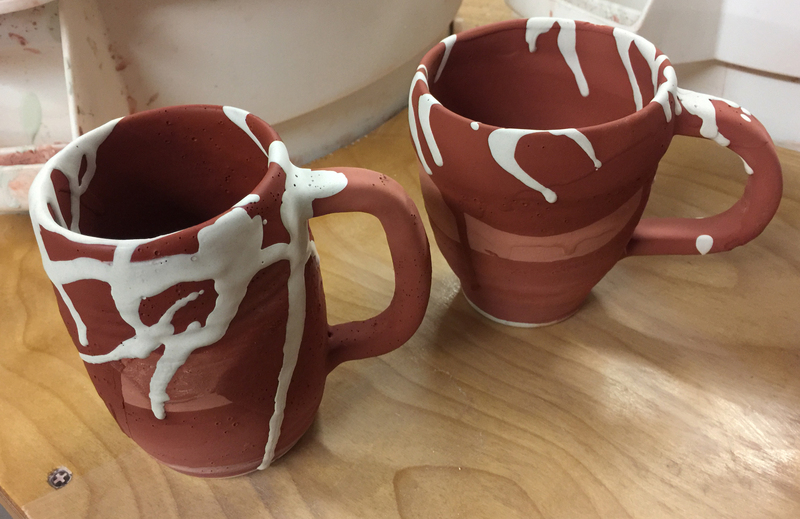 What a fun exploration of glaze play I thought! I wondered how they did it (more than one potter had examples). BUT at studio I had to hurry hurry to complete my little goal – oooh dear. Not the technique I was hoping to do BUT I got an atypical technique completed. Here is the current set using a ‘new’ technique – brushed on Coastal Blue in the mid section, dipped in Starry Night on top and bottom – – and then I nearly forgot about the INSIDES! So my Starry Night kind of went all over on 2 pieces for sure. And the last minute cream shower along the rim and the sides…. 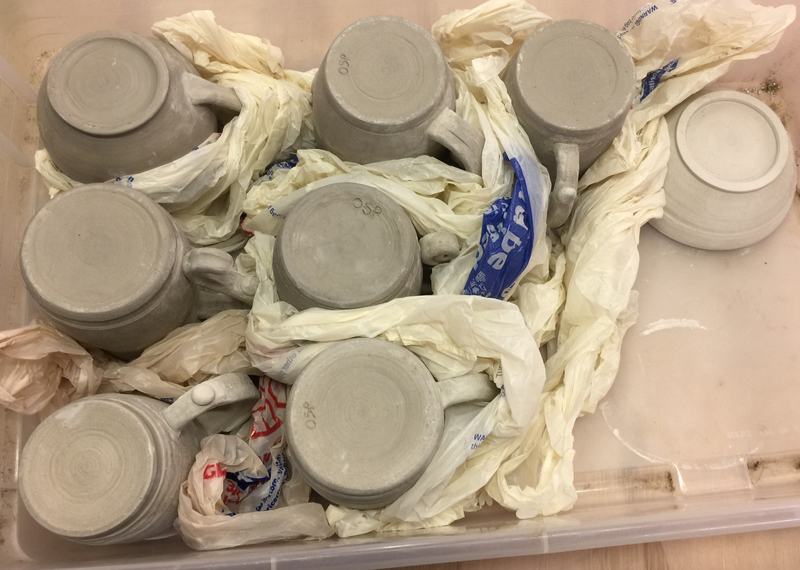 Okay so I ended up placing these 4 pieces on pieces of broken shelving JUST IN CASE the glazes ran – and thankfully I did. Three of the four ran. I thank my fellow Clayscapes Pottery potter friends with oodles of more experience than I for suggesting the shelving bits! Success can be achieved while #Learning! Run Run Run. For this attempt I’d give myself a C- for the results. 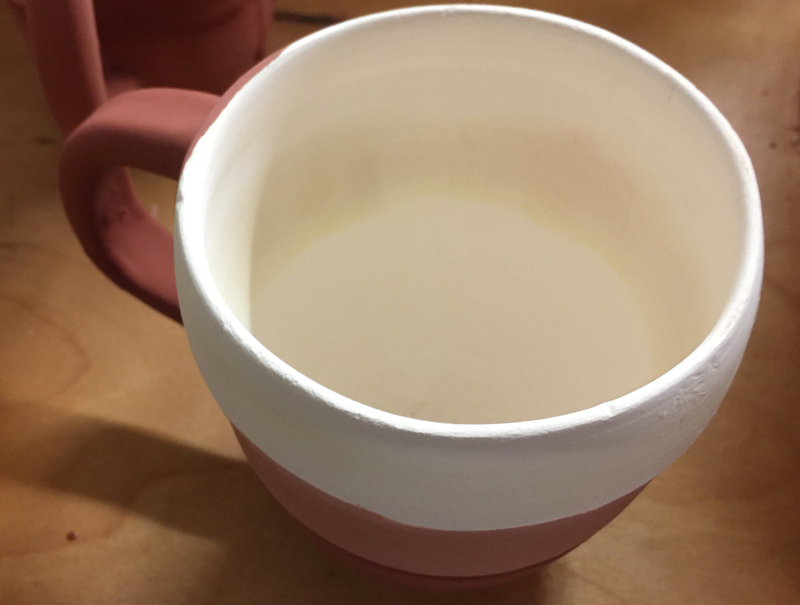 If I choose to explore the mid-section Coastal Blue glaze I may put it on taller pieces, reduce the # of seconds i hold the Starry Night glaze on the bottom and glaze the interior first. I’d give myself an A+ for effort!